Dr. Clark G. Gilbert will be inaugurated as the first president of BYU-Pathway Worldwide on November 16, 2017, at 7 p.m. The ceremony will take place in the Church’s Conference Center Theater in Salt Lake City. Russel M. Nelson, president of the Quorum of the Twelve Apostles of The Church of Jesus Christ of Latter-day Saints, will preside at the inauguration and officially install President Gilbert in his new role. Elder Kim B. Clark, commissioner of the Church Educational System (CES), and President Gilbert will also provide remarks. Music will be provided by a choir comprised of BYU-Pathway Worldwide students from throughout the Salt Lake valley. Due to limited space, the inauguration ceremony will only be open to invited guests. The ceremony will also be streamed online starting at 7 p.m. Locations holding PathwayConnect gatherings during the inauguration are encouraged to watch the broadcast together to fulfill their meeting requirements for the week. For more information about the inauguration, please contact the Inauguration Office at inauguration@byupathway.lds.org or +1 (208) 496-1819. Prior to his new assignment, President Gilbert served as the 16th president of Brigham Young University-Idaho from April 2015–April 2017. 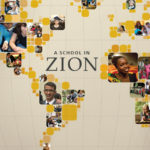 As president of BYU-Idaho, he focused on increased access to education and student mentoring. He also pioneered the growth of the university’s online programs — more than 20 percent of BYU-Idaho’s campus credits are now taught online. 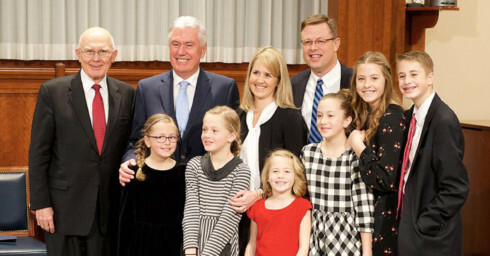 The Gilbert family with President Dieter F. Uchtdorf and Elder Dallin H. Oaks at the announcement of BYU-Pathway Worldwide in February 2017. President Gilbert started his time at BYU-Idaho in 2006 and served in a variety of positions, including associate academic vice president. 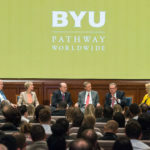 This particular role had President Gilbert oversee online learning, and he played a vital part in the creation of the Pathway program (now called PathwayConnect), which is a core offering of BYU-Pathway Worldwide. Between his stints at BYU-Idaho, President Gilbert served as president and CEO of Deseret News Publishing Company and Deseret Digital Media from 2009–2015. From his work with expanding the national prominence of Deseret News, he was recognized as the 2011 Innovator of the Year by multiple media associations. Early in his career, President Gilbert taught as a professor of entrepreneurial management at the Harvard Business School where he taught and studied in the field of organizational innovation. He recently co-authored the book Dual Transformation in Harvard Business School Press, which helps senior leaders look at how to organize for change. President Gilbert graduated from Brigham Young University with a bachelor’s degree in international relations. He earned a master’s degree in East Asian studies from Stanford University and a doctorate degree in business administration from the Harvard Business School. President Gilbert has served in multiple ecclesiastical roles, including counselor in a stake presidency, bishop, Young Men’s president, and Scoutmaster. He currently serves as a gospel doctrine teacher.